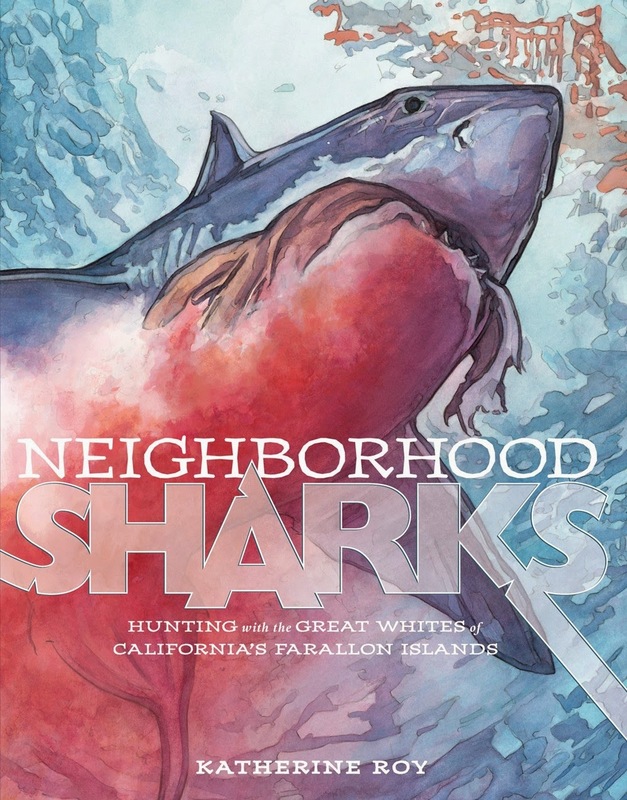 Neighborhood Sharks: Hunting with the Great Whites of California's Farallon Islands, by Katherine Roy (ages 7-11) -- absolutely terrific, gripping nonfiction!! Did you know the world’s largest wild population of great white sharks lives just 30 miles from San Francisco? How about that white sharks are the world's largest predatory fish, growing up to 21 feet long? Sharks **fascinate** my students and Neighborhood Sharks, by Katherine Roy, is absolutely terrific. They can't get enough of this new book! Katherine Roy, as both illustrator and author, combines compelling paintings with informative text to explain how these predators are able to hunt down their perfect prey so effectively. 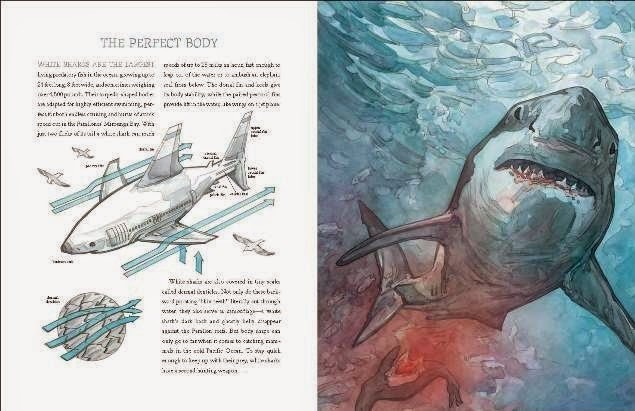 She focuses on the shark’s streamlined body, warmed blood, excellent vision, endless teeth and projectile jaws--providing clear scientific information while hooking readers with dramatic, vibrant paintings. What I loved best reading this with both 2nd graders and 5th graders is how different students can access the wide range of information she provides. Younger students listened to some of the text, but really examined the illustrations and thought about them. They loved this drawing comparing the shark's body to an airplane (see below) -- and together we talked about different things that help sharks swim so quickly. As teachers, we call this visual literacy--helping students understand diagrams, gaining information from illustrations--an essential skill, especially for nonfiction. Illustrators talk about how they're layering the information, both in the visuals and the text. But really, the kids are just soaking up knowledge, fascinated by how sharks hunt, eat and grow. In Neighborhood Sharks, Roy not only shares information about sharks, but she also helps kids think about the scientists who study the sharks. 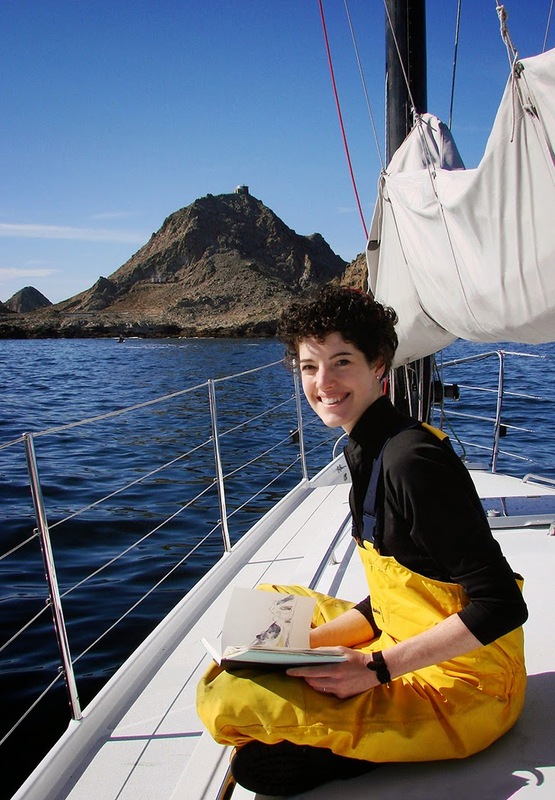 She spent four days at sea with them, observing them, learning about their work studying these powerful animals, making sure that all her facts were correct -- so she could really give readers the feeling that you are there swimming with the sharks. Are you as fascinated by this as my students and I are? Check out Katherine Roy's blog -- I especially loved reading about her inspiration for adventure and seeing some of the drawings progress. I will be interviewing Katherine for Parents Press in January and can't wait to share more of our conversation. Until then, go find a copy of this book! The review copy was kindly sent by the publishers, Macmillan Books. If you make a purchase using the Amazon links on this site, a small portion goes to Great Kid Books. Thank you for your support. 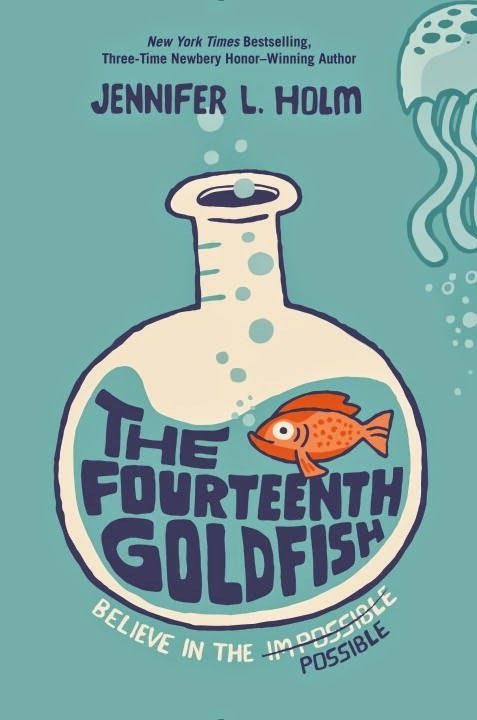 Kids and teachers are loving a new book, The Fourteenth Goldfish, and it makes me so happy to hear them raving about it. I had a chance this weekend to sit down with Milana, a ten year old I lent my copy to, and we really had fun talking about this book. Talking about books together really helps us deepen our appreciation, deepen our thinking about the layers in a story. Sixth grade is tricky for Ellie, but the day her mom brings home a new kid turns everything upside down. At first, he seems like a typical surly teenager, but something "tickles at (her) memory." Ellie is shocked when she realizes this is her grandfather Melvin, somehow turned into a thirteen year old boy. "I discovered a cure for aging... the fountain of youth!" he shouts. But he's stuck in this new body and can't get into his lab to recover the T. melvinus specimen, the species of jellyfish that helped him change back into a teen. My young friend, Milana, loved reading this so much that she bought one of her good friends a copy. "I got it for my friend because she's really into science and she really likes sea life. Now she's started it and won't stop reading it." Holm seamlessly weaves into the story a love of science and Milana picked up on this. Right away, she talked about wanting to learn more about Salk's discovery of the cure for polio and Oppenheimer's race to build the atomic bomb. As I've been rereading this, I love how much science Holm incorporates, especially as Ellie gets to know her grandfather. Melvin tells Ellie, "Scientists fail again and again and again. Sometimes for our whole lives. But we don’t give up, because we want to solve the puzzle... Scientists never give up. They keep trying because they believe in the possible." The relationship between Ellie and her grandfather is what makes this book special for me. Holms creates believable, nuanced characters and I think that's one reason so many readers are responding to this story. When Melvin, Ellie's grandfather, tells her mother, "'Your daughter’s interested in science. She shows great aptitude. You should encourage her.' I feel a flush of pride. Maybe this part of me—the science part—was there all along, like the seeds of an apple. I just needed someone to water it, help it grow. Someone like my grandfather." As Milana and I were talking more about the characters, I asked her if Melvin reminded her of any of her grandparents. I wish Jenni Holm could hear this young girl talking about her grandfather, a doctor who's always busy thinking and talking on the phone -- and how this story helps her see a different side of him. Milana told me, "It makes me wonder what my grandfather looked like, how he acted and what he was interested in when he was my age." The Fourteenth Goldfish left me thinking most about the themes essential to science: curiosity, discovery, possibility. A recent TED Radio Hour explores these same things, albeit more for adults. It starts with James Cameron talking about his childhood, when he loved collecting and studying all sorts of things, curious about everything. "It's almost like the more we know about the world, the limits of what's possible start to crowd in on us." But this curiosity stayed with him--and imbues both his movies and his love of oceanography. The real power of The Fourteenth Goldfish? It's like so many well-crafted stories: creating conversation, creating a moment to think a little more deeply about those around us, creating an ah-ha moment that curiosity and a passion for discovery lay at the heart of science--believing in the possible. The review copy came from my home collection and our library collection and Milana's collection (I've already purchased many many copies!). If you make a purchase using the Amazon links on this site, a small portion goes to Great Kid Books. Thank you for your support. As the holidays approach, many children are excited about visiting grandparents. I wanted to share three different picture books that show different small moments as children spend time with their grandparents. 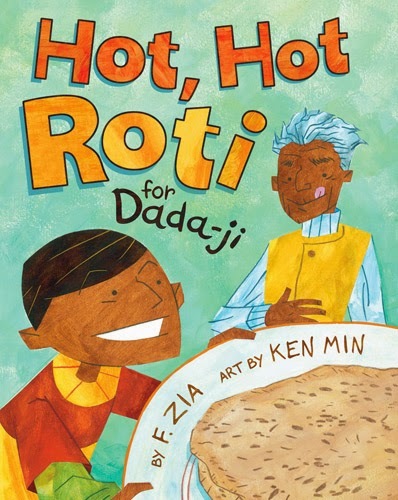 Young Aneel’s grandfather Dada-ji has great fun telling how he got “the power of a tiger” when he was a boy by eating the best roti in town. Aneel is so excited that he races to the kitchen to make this Indian flatbread. Kids love the way that Dad-ji exaggerates the story from his childhood. Zia's writes with verve and gusto. She is "a writer and an elementary school teacher who grew up in Hyderabad, India." As Aneel starts gathering ingredients to make his roti, the fun really begins. Kids can relate to how food brings people together and will love the way Aneel takes charge. As Max drives home, he keeps watch of that same moon and is reassured by its presence. This quiet warm book glows softly with the love between African American grandfather and grandson. It's a wonderful read-aloud that helps talk about how the people we love stay with us in our hearts long after we have to say goodbye. What do we do when our children are afraid? You'd never know it by looking at the cover, but this young boy is scared by all the noises and commotion in the bustling city. He's excited to see his Nana and her new apartment, but oh how the city noises are just too much. "But Nana was right. 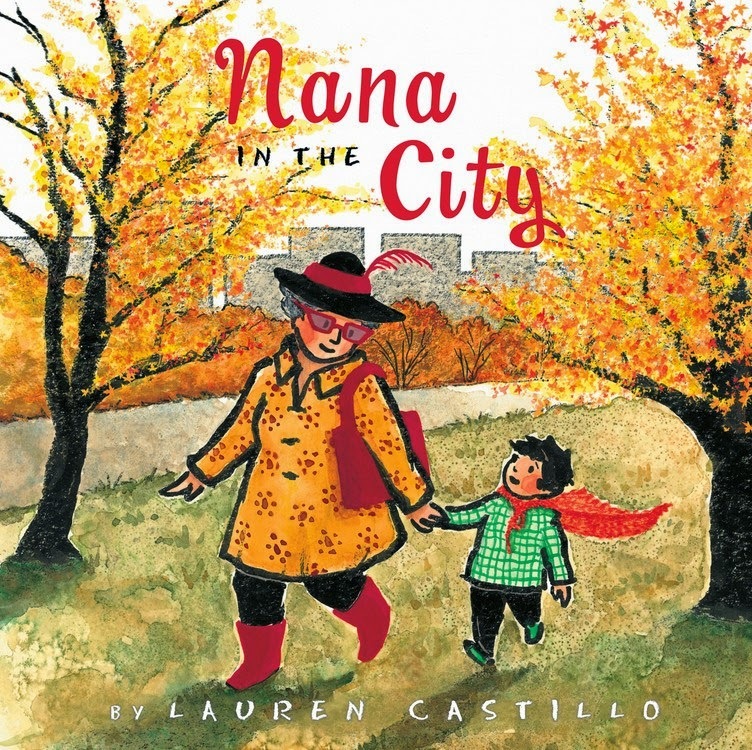 The city was not filled with scary things..."
Do you have a favorite book that reminds your children of times they spend with their grandparents? Or maybe after the holidays, you and your child could write a story together about a day they spent with their grandparents. The review copies were kindly sent by the publishers, Lee & Low, Penguin and Clarion. If you make a purchase using the Amazon links on this site, a small portion goes to Great Kid Books. Thank you for your support. 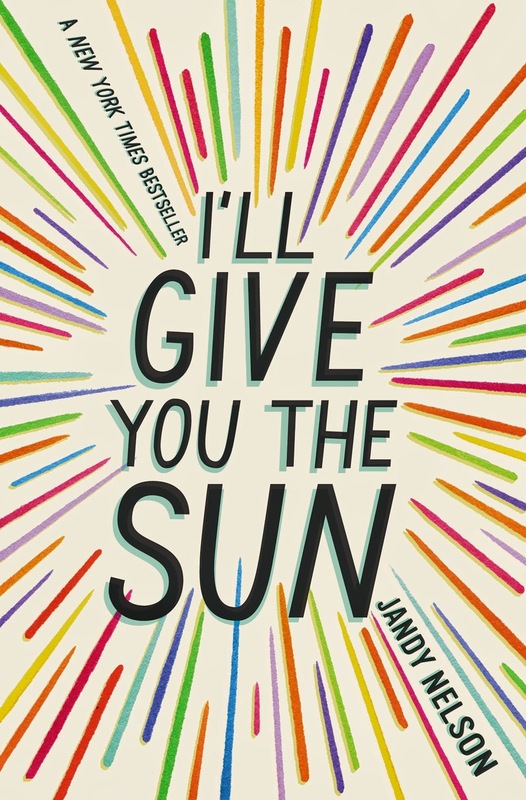 Oh my… I just finished reading Jandy Nelson’s I’ll Give You the Sun, an incredible new YA novel, and I just have to talk with someone about it. I’m sitting on an airplane, all by myself, and my mind, my heart is bursting. This post is NOT what I normally write here, but life must be about taking chances. That I know. My family and friends know that I come alive when I can talk about books with friends who live and breathe stories the same way as I do—I sparkle in a way that I rarely do in my real world. I’m heading home from a terrific book conference (YALSA’s YA Lit Symposium) where I spent time with a new friend, Rob Bittner. Nelson tells the story of Noah-and-Jude, twins who are incredibly close yet pull apart—each hiding, wrapped in their own secrets that they’re sure no one will understand. Brother and sister, Noah and Jude grapple with their relationships with their mother and father as well as with each other—so there are many times I reflected on how each responded as a boy and as a girl. And yet both are fully nuanced characters, never reduced to gendered reactions. Chapters alternate from each twin’s perspective, and Nelson carefully draws the reader inside each person. Both teens are artists, and it was fascinating hearing, feeling, seeing, thinking the world through their eyes. Nelson not only crafts the story from two points of view, she tells it from two points in time. Noah’s chapters take place when the twins are thirteen and fourteen. 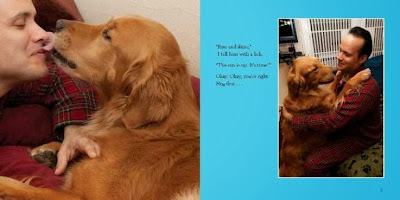 Jude, his twin sister, is an integral part of his story, but it is all from Noah’s perspective. Jude’s chapters take place when they are sixteen, by which point the twins have become completely estranged, an invisible wall dividing them. But they have started building the wall long before. As a teen, I totally understood that idea of building walls, of closing the shutters so that my family stayed out of my thoughts. Yep, my mom may read this (Hi, Mom! ), and I’m guessing she remembers oh too well how there were about two years where we basically didn’t talk. I’m guessing that as a teen, there were times when I just had to pull inside myself to try to figure things out, to feel the intense feelings, to wrestle with my own uncertainties. I was stunned by the way Nelson made me think about this. Jandy Nelson writes about both Noah and Jude’s physical, sexual feelings with incredible sensitivity, passion and honesty. I raved to Rob how much I loved the way she described Brian through Noah’s eyes—both how Brian looked, but also how it made Noah feel. But I’m fascinated, now that I’m rereading it (plane ride, remember? ), how slowly their connection developed. I mean, right from the beginning Noah had this electric reaction, but as I reread it, I see that they’re just stumbling through those early conversations as their friendship develops. It isn’t until Noah sees two guys passionately kissing at a party that everything started clicking in place for me as a reader. Jude’s struggles especially resonated with me. She meets a guy (English, yep) who makes her feel, intensely feel—even though she’s doing everything she can to close herself down from her feelings. And I think that’s an essential part of what I remember about intense friendships from my teen years and from falling in love. That sense that someone sees you for you, someone gets you. But I also had such a visceral reaction to Jude’s description of Oscar. Okay, Rob, so full confession time here. I’ve just spent the last hour (plane ride, right?) rereading Jude’s chapter when she starts working in Guillermo’s studio and falling head over heals for Oscar. Highlighting every description of Oscar. In pink. And I’m pretty sure that I’ve been transported back to my 20 year old self when I first met Ed. English? Check. Banter? Check. Tall, muscular? Check. Irresistable? Check. So I can’t include all the parts that I’ve highlighted (definitely TMI), but I can tell you that Jandy Nelson captured Oscar exactly right. And then the ending… which I won’t say too much about. Except that it’s filled with hope and family and so many layered ideas that I’ll be thinking about it for weeks to come. I’ll be thinking about how people I love still live inside of me, even though they have passed away (Molly, Nana, GrandTom). And how important it is to take a chance. So I’ll quickly put on my librarian shoes to say hand this book to a teen who loves realistic fiction, likes complicated stories because life is complicated. And when I say teen, I really mean teen – I would not put this in an 8th grader’s classroom. Some 8th graders might connect, but most will get much more out of it in a few years. I know this post has gone on forever. But maybe, kind readers, your interest has been piqued. So here's a preview of I'll Give You the Sun from Google Books. I purchased the review copy through iBooks (plane ride, remember?). I can assure you that I'll be purchasing several more copies to give to friends. If you're dying for a copy, leave a comment. Persuade me, and I might just purchase an extra one for you. If you make a purchase using the Amazon links on this site, a small portion goes to Great Kid Books. Thank you for your support. As students and families celebrate Veterans Day, I always think about how to honor our veterans in a way that young students today can understand. 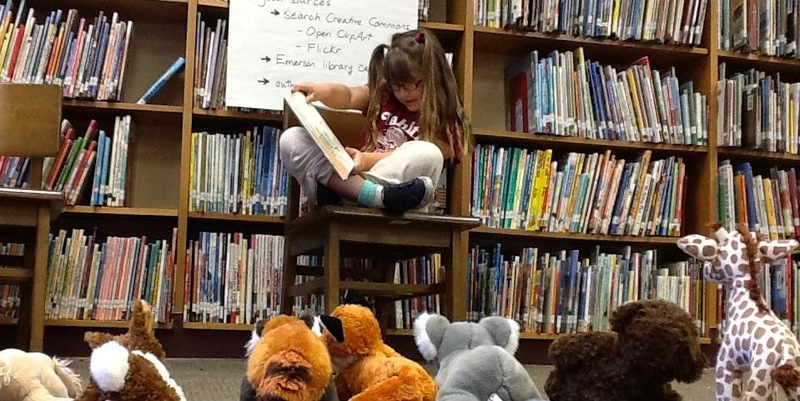 My older students love reading historical fiction, but what about younger students? This week I am sharing a new book that introduces young students to the difficulties soldiers can face returning from war, and the loving help that service dogs can provide. Former Army Captain Luis Carlos Montalván was wounded during his two tours in Iraq. Montalván suffered from a traumatic brain injury and also post traumatic stress disorder (PTSD). Recovery was difficult when he returned home, and he ended up withdrawing from friends and family. 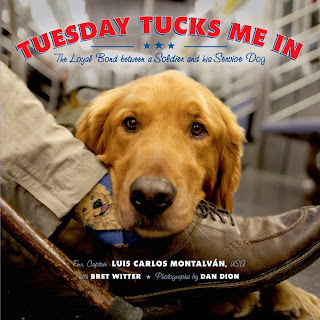 In this picture book, golden retriever service dog Tuesday shows readers what his life is like helping Montalván through daily life. He provides companionship and encouragement. Tuesday can even sense when Montalván is about to have a panic attack and can help him get through it. "Every morning my friend Louis wakes up to this... "
"Rise and shine," I tell him with a lick. "The sun is up." 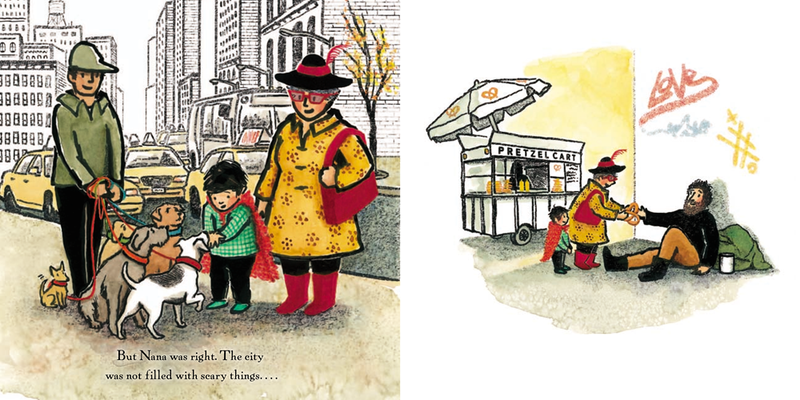 Children will really like the full color photographs that help them get a sense of Tuesday's life as he navigates the subway, sidewalks and life in the city. The narrative helps readers understand the support Tuesday provides and, even more importantly, helps them empathize with Luis. "Luis has trouble with balance, and he used to struggle on the stairs. But now he grabs my handle and knows that I am there." 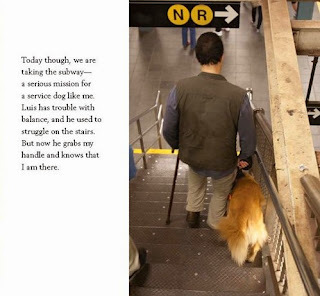 I especially liked the author's note at the end, where Montalván explains service dogs to young readers. "Tuesday is a service dog. 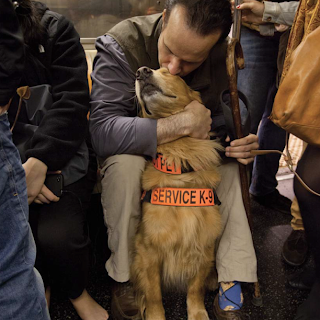 Service dogs are trained to help people with disabilities live more independent and happy lives." Our Berkeley Unified teachers have just completed five days of conferences with parents, and I wanted to follow up with a librarian's perspective on recommending books for kids. Our teachers do a remarkable job individually assessing students' reading levels to gauge their progress, development and challenges. At each conference, they let parents know how their children are developing and what level they have reached. But what do parents do with this level? 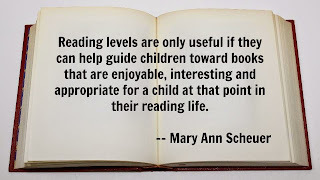 Reading levels are only useful if they can help guide children toward books that are enjoyable, interesting and appropriate for a child at that point in their reading life. I do not label my books with reading levels, and I have compared different systems enough to know that they conflict much of the time. 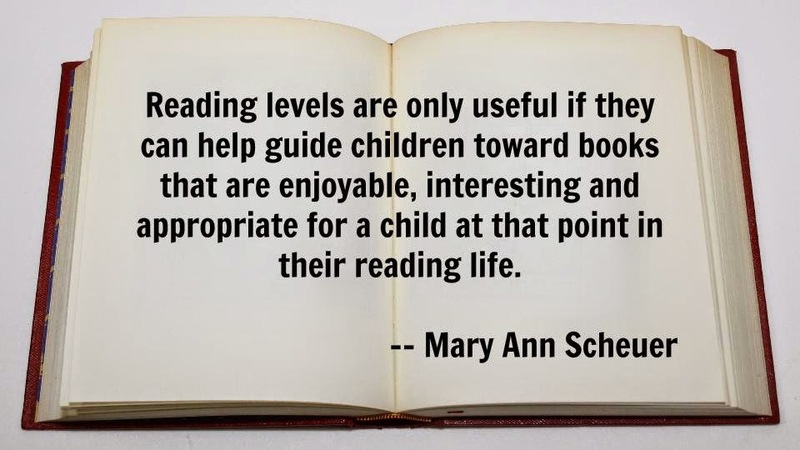 And yet, published reading levels are helpful as a starting place if you don't know a book. Our teachers use Fountas & Pinnell levels, which take into account a book's vocabulary, sentence length and text structure. While classrooms have leveled libraries, how do parents help direct kids at home, the library or the bookstore? My best advice is to figure out what has worked well for your child, both in terms of interest and complexity, and build on that. Ultimately, we need to ask our children to take charge in figuring out if a book is working for them. I always ask kids to open a book, read a little and see how it feels. But I know that kids need a starting place, a way to narrow the field so they can choose from a set of books that might work. That's where reading levels and recommended lists can help. At this year's conferences, we shared recommended reading lists which used reading levels to help direct kids and parents. Feel free to download these or share them with teachers and families in your schools. You'll notice that the grade levels are not included on the reading lists. Many teachers wanted to be able to use these for kids based on their reading levels, not based on the student's grade. "We humans are pleasure-seekers, doing things over and over if we like it. We go to favorite restaurants and order the food and beverages we like, not the stuff we hate. So if you want to ensure children visit "reading" more often, make sure they like it more than they hate it. How do we get them to like it that much? Read on." Friends have fun reading together! Many thanks go to all the students at Emerson for helping me test out so many books. If you make a purchase using the Amazon links on this site, a small portion goes to Great Kid Books. Thank you for your support. Do you have fond memories of reading your history textbooks? Probably not. So how can we make history more interesting for our children? We want our children to envision what it would have been like to live long ago, to make the messy decisions that people had to make, to struggle and wrestle with life, warts and all. And yet we also need to convey basic information about historical periods and figures. How do we balance the facts with the engaging material? As a case in point, I've been helping 5th grade students gather information about famous explorers from different eras. They're investigating Marco Polo, James Cook, Hernando Cortes, Amelia Earhart, Sally Ride and many others. Their teachers want them to practice note-taking skills. What resources will help them the most? "How are we supposed to choose which explorer to do our report on if we don't know anything about them?" Students need to begin their research process by learning some basic facts about their subject. This should be pretty easy for the children to read, since they need to focus on building a clear framework in their minds. I would suggest just reading at this point, not taking notes. 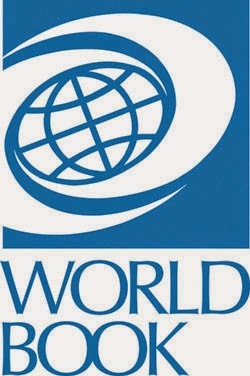 We start with World Book Kids, the junior version of the World Book Encyclopedia. "I call this Google for 5th graders." 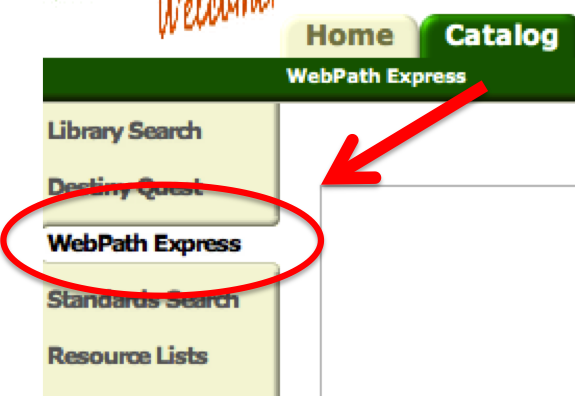 We have recently added WebPath Express to our Follett Destiny library catalog. This service guides students in their Internet searches, helping them go directly to accurate, age-appropriate sites. Students are able to find reliable resources quickly, without having to filter out commercial or college-level sites. Students will like the clear sentences and frequent illustrations in this brief introduction to nearly twenty explorers from ancient to modern times. Each explorer's major achievements and struggles are covered in a two-page spread, so the pace moves quickly. Sentences are relatively short, and drawings keep interest high. "Marco Polo was born in Venice, in Italy. In 1271, when he was just 17 years old, he set off for China with his father and his uncle. They took gifts for Kublai Khan, the powerful ruler of China in the 1200s CE." This type of book will help students develop a "research report" tone to their own writing. It is factual and straight forward. But it does not have much depth, it does not really prompt students to connect to what they're reading or to ask questions. "Matthew Henson and Robert Peary shared many an unappetizing meal in the frozen land around the North Pole. But in the United States they wouldn't have even been allowed to eat together, as restaurants were segregated into 'black' and 'white' sections." In just three pages, Krull helps readers get a sense of the challenges Henson faced and his remarkable achievements. She incorporates quotes from Henson to give a sense of his perspective. Teachers and librarians should note, however, that she does not indicate the sources for her material, but just provides sources for further reading. 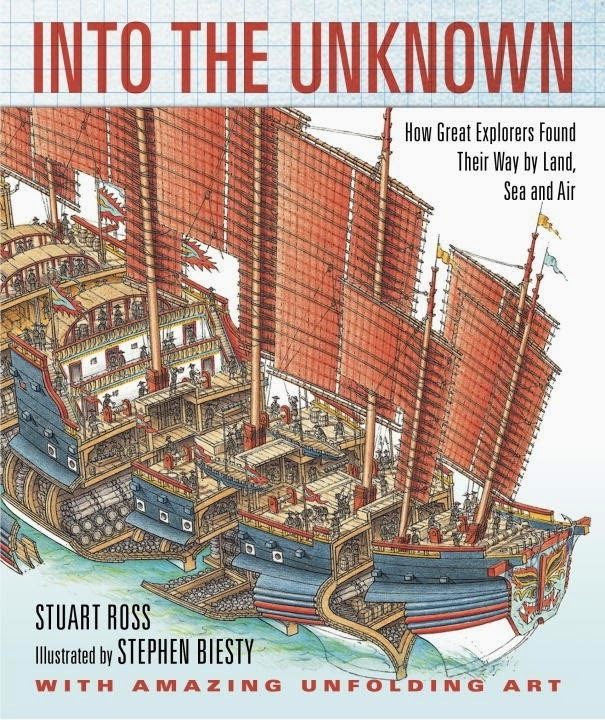 Stewart Ross and Stephen Biesty absolutely captivate me each time I read a section of Into the Unknown. Biesty's intricate illustrations draw me right into each scene, helping me imagine what it would be like to be part of an expedition. Students love the fold-out illustrations and the cut-aways that show you the inside of ships. Ross's descriptions include enough detail to engross me without overwhelming me. They have a strong narrative flow, conveying the dramatic pull of these stories but also helping young readers start forming their own questions and conclusions. 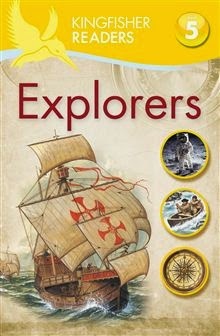 The review copy of Explorers came from our public library. 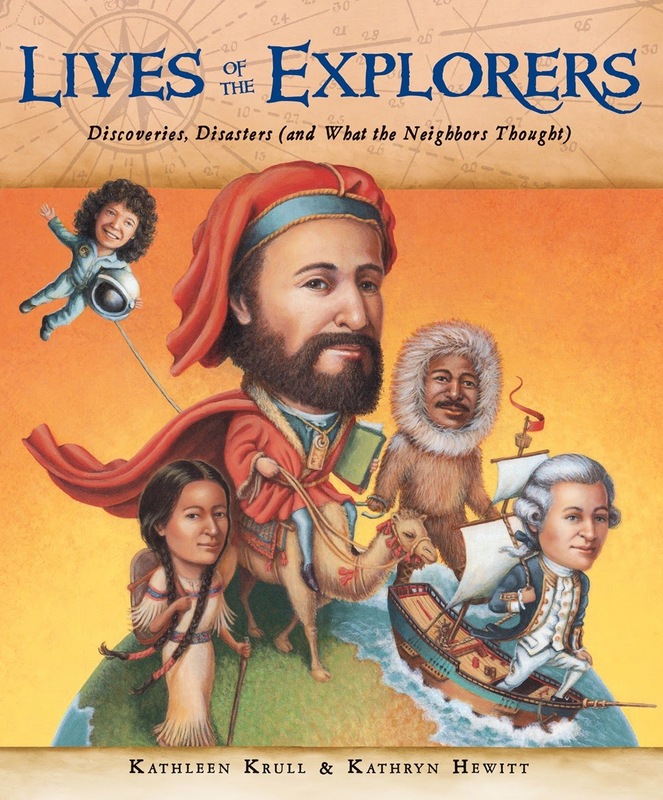 The review copy of Lives of the Explorers was kindly sent by the publishers, Houghton Mifflin Harcourt. The review copy of Into the Unknown was kindly sent by the publishers, Candlewick. If you make a purchase using the Amazon links on this site, a small portion goes to Great Kid Books. Thank you for your support. Our world often seems filled with a cacophony of chatter and bickering -- whether it's on the playground or at home. And so I relish the moment when I can slow down to savor a quiet moment with my students. 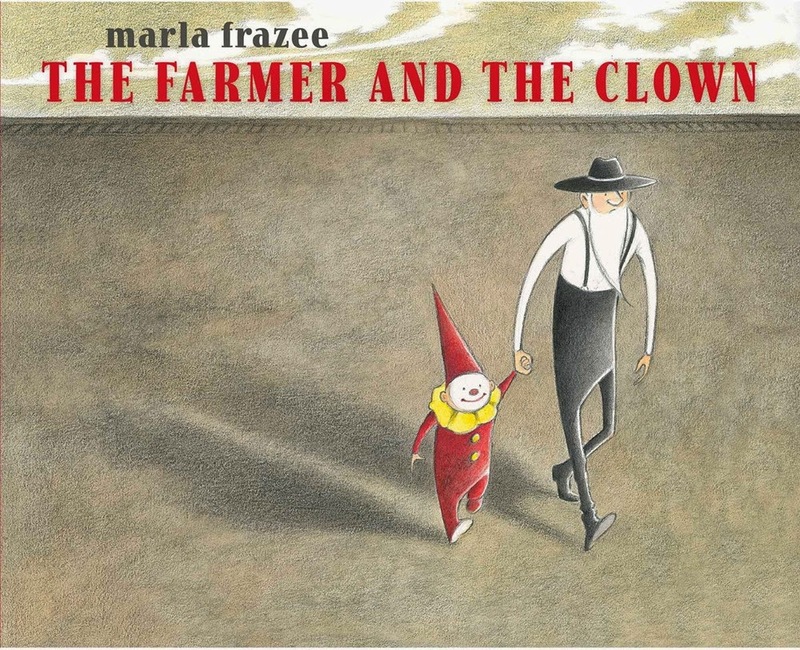 Marla Frazee's newest picture book, The Farmer and the Clown, creates that quiet moment and helps us see the power of friendship. As the farmer and clown share time together, you can see the farmer's whole disposition change. I love talking with children about what they notice in picture books. With a wordless book like this, we need to listen with our eyes and our heart--just the way the farmer starts listening to the small child. What moment does the farmer start to change? "I listen with my ears, eyes and heart — When I listen as well as hear, I can really understand. When we listen with our ears, our eyes, and our hearts, we become deep listeners who can “hear between the lines.” Our ears bring us the words and intonation; our eyes bring us body language, gestures, and facial expressions; and our hearts bring us empathy—allowing us to walk in someone else’s shoes." I think this perfectly describes how we can understand the farmer--and why this book engages readers so emotionally--without any words at all. By listening closely, we develop empathy for another person. Read more about the process Marla Frazee used in creating this beautiful book, one of my favorites of the year, at Seven Impossible Things Before Breakfast -- I loved all the work in progress she shows. I also love the conversation Marla has with Roger Sutton at this Horn Book interview. Read The Farmer and the Clown with a little person in your life, and enjoy the warmth of the friendship. Read it with an older child and relish the conversation it can start. Or just find a peaceful moment for yourself and savor the beauty of listening with our eyes, ears and heart. The review copy was purchased for our school library. 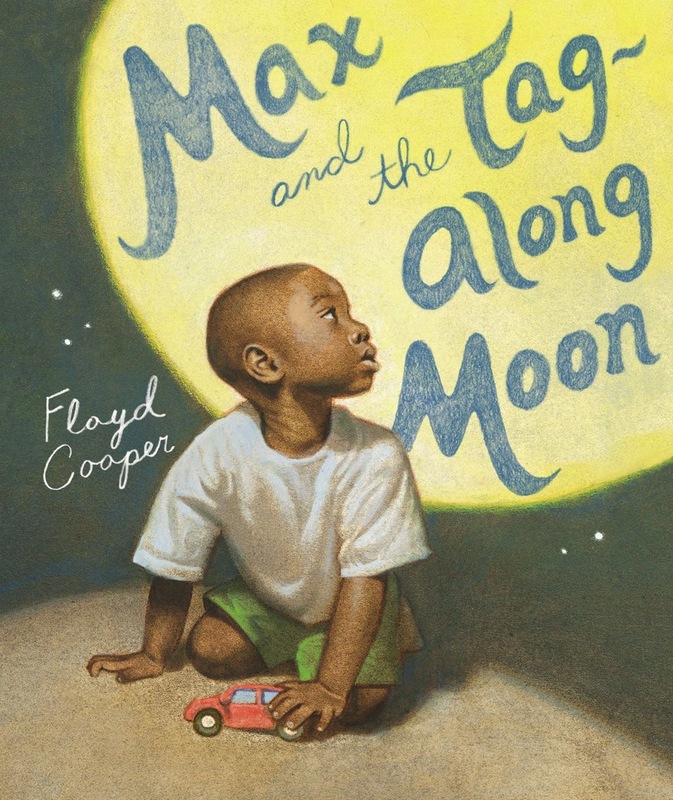 Illustrations are copyright ©2014 Marla Frazee, used with permission from the publisher Simon & Schuster. If you make a purchase using the Amazon links on this site, a small portion goes to Great Kid Books. Thank you for your support.